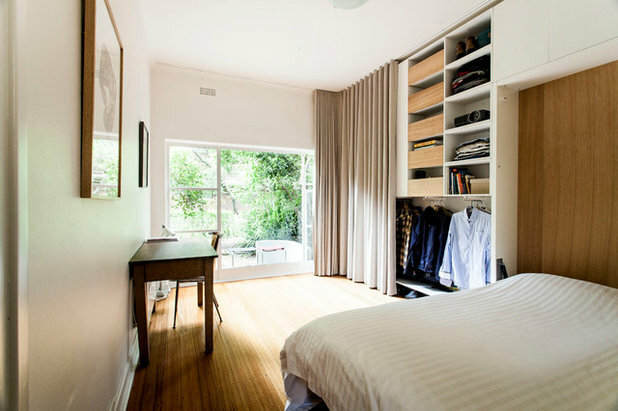 Having an organised storage set-up for clothes and shoes not only keeps your bedroom tidy, it can help you speed through your morning routine. 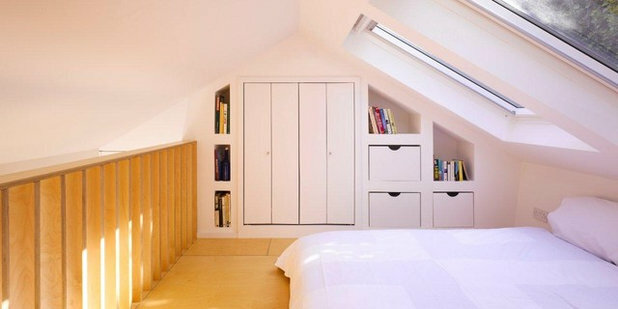 But it’s not always easy – particularly if your bedroom is small and storage is in short supply. If your cupboard doors refuse to budge and you’ve become the accidental owner of a floordrobe (get it?! 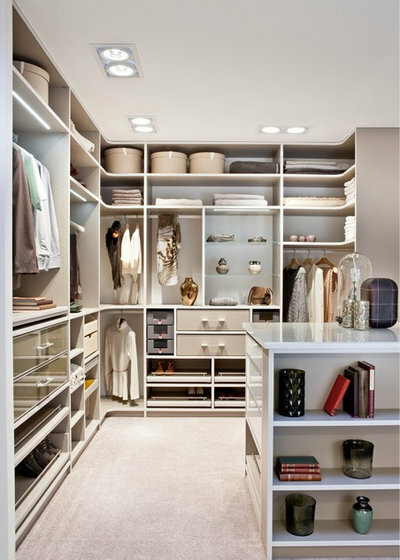 ), here are 32 smart and practical storage ideas to get your clothes and accessories under control. 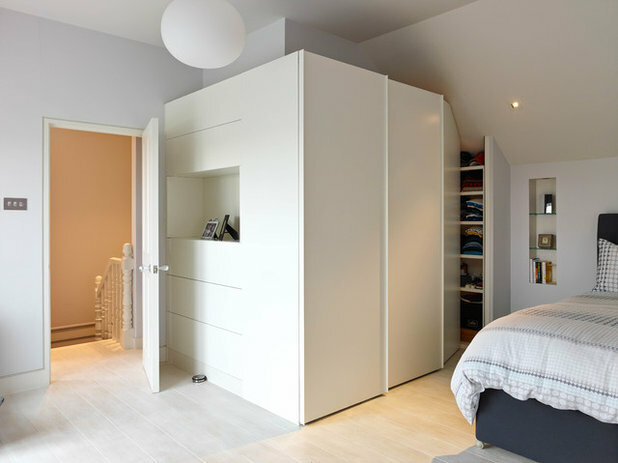 Features: Measuring up exactly what you need to store – as the owners have clearly done here – allows you to make the best use of space in a custom-made wardrobe. 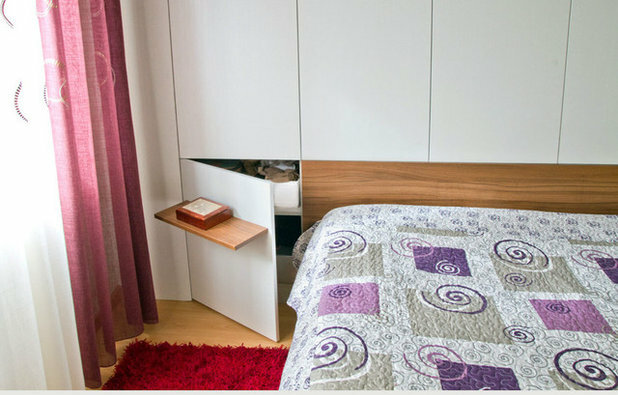 Features: A custom wall cabinet above the bed provides plenty of space for clothes without impinging on precious floor space. 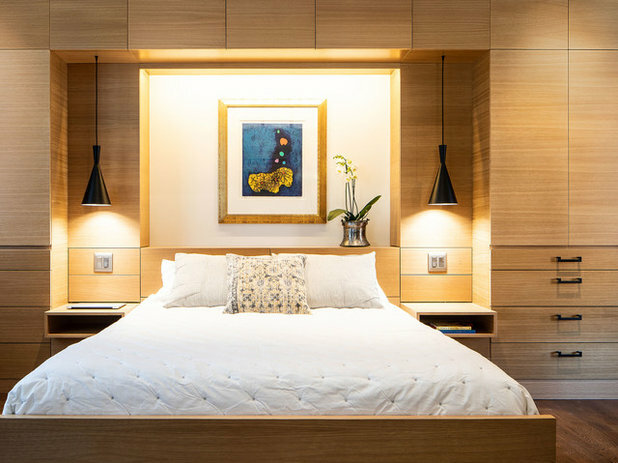 It even features under-cabinet lights so the owners can read in bed at night. 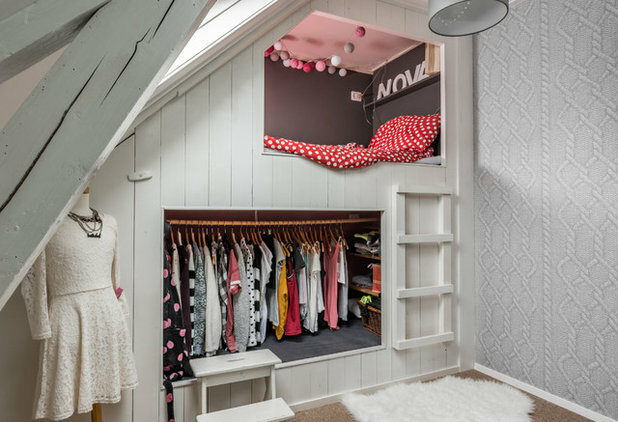 Features: Hanging storage downstairs and a cosy bed nook upstairs – delightful! 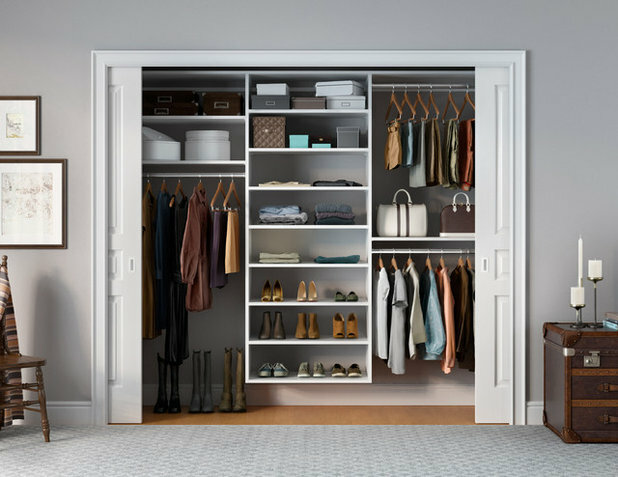 Features: A deceptively simple made-to-measure design that includes oodles of space for shoes, accessories, folded clothes and hanging items. 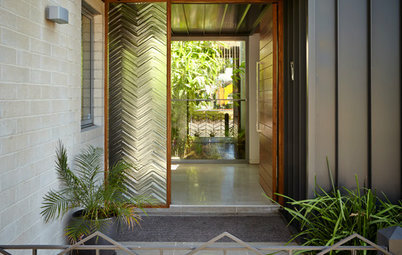 Sliding doors are a great option for small spaces as they won’t protrude into the room when open. Features: This matt-blue freestanding wardrobe makes a statement in a child’s room. 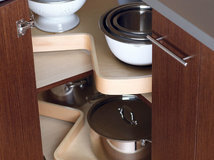 Positioning the drawers at the base of the unit makes them easier for little hands to access. 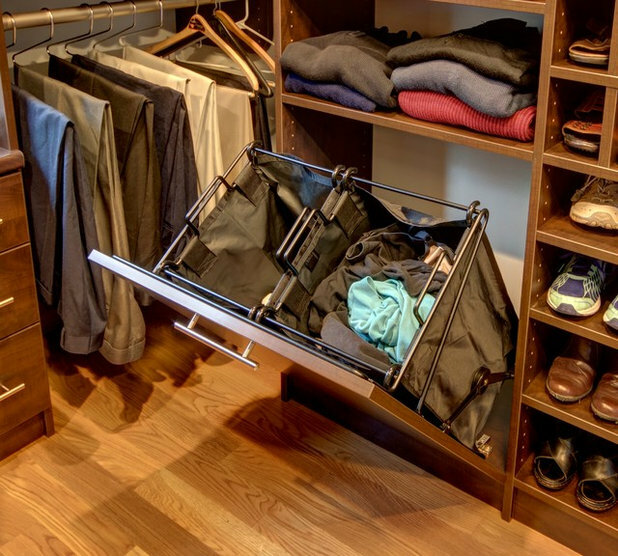 Features: A pull-out trouser rack prevents wrinkles, saves space and offers easy access. 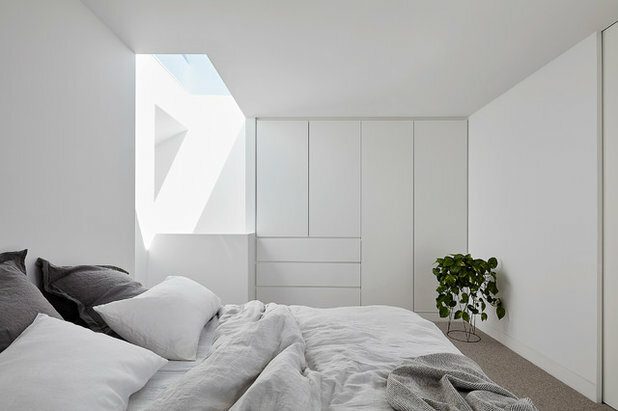 Features: Do you have a small bedroom with tall ceilings? 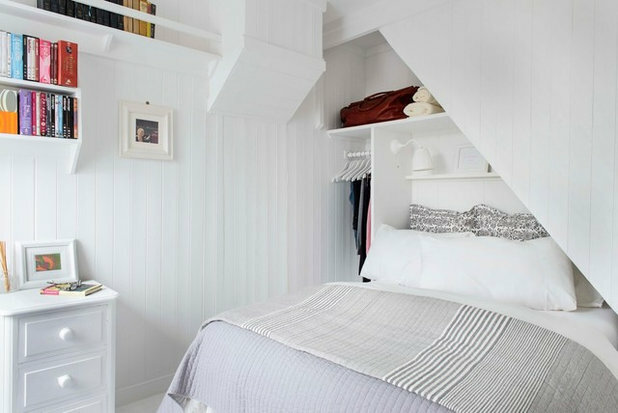 Boost your storage potential by taking built-ins right to the ceiling and adding a ladder, as the owners have done here. 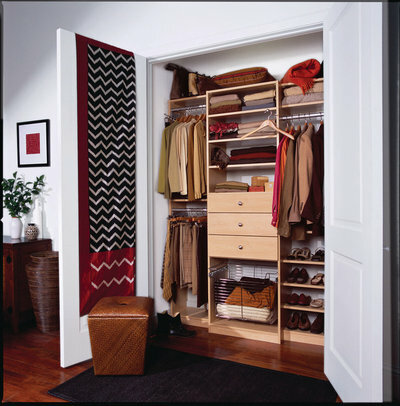 Best for out-of-season clothes or items that you don’t have to access every day. Features: A revolving unit such as this one can double your shoe-storage potential. 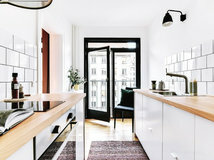 Features: No space for a wardrobe? 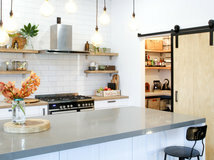 Just hang a clothes rail from the ceiling instead. 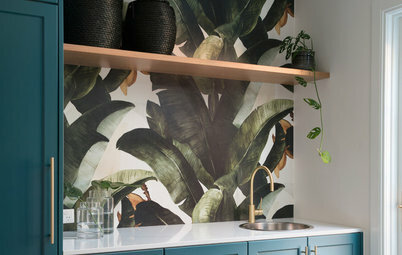 The owner of this Toronto unit in Canada has used plumbing pipes for a quirky touch. …here’s a view from the back. Features: A pull-out laundry hamper built into your wardrobe makes it easy to keep washing under control. 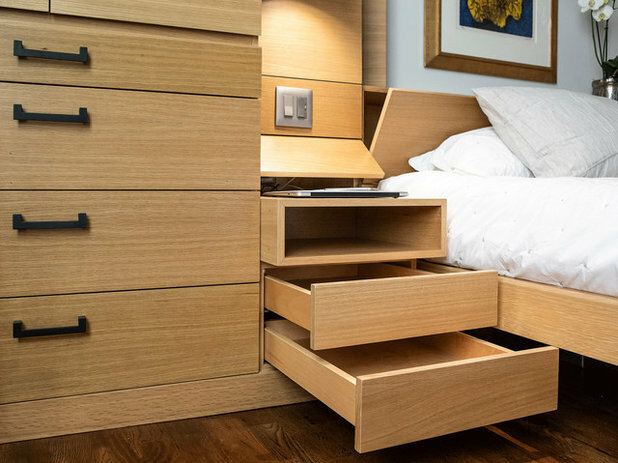 Features: Deep drawers in the base of the bed are great for storing folded items, and won’t encroach on floor space. …here’s another view of that curtained wardrobe. Features: Open box shelving on wheels makes it easy to access folded items – plus, you can move the unit around to suit your needs. 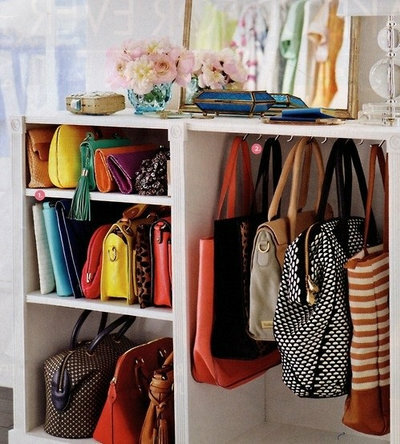 Features: Handbag storage can pose just as much of a challenge as clothes – especially if you have an extensive collection. 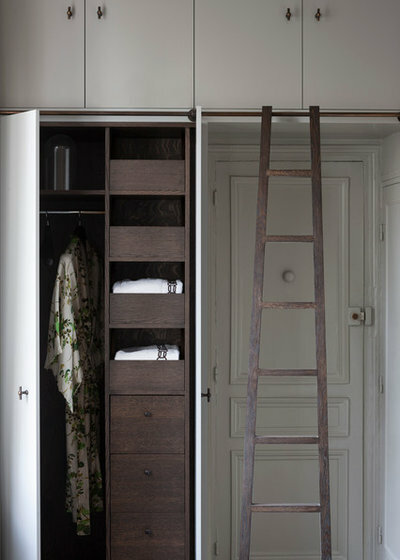 We’re loving this made-to-measure cubby solution, where not a centimetre is wasted. 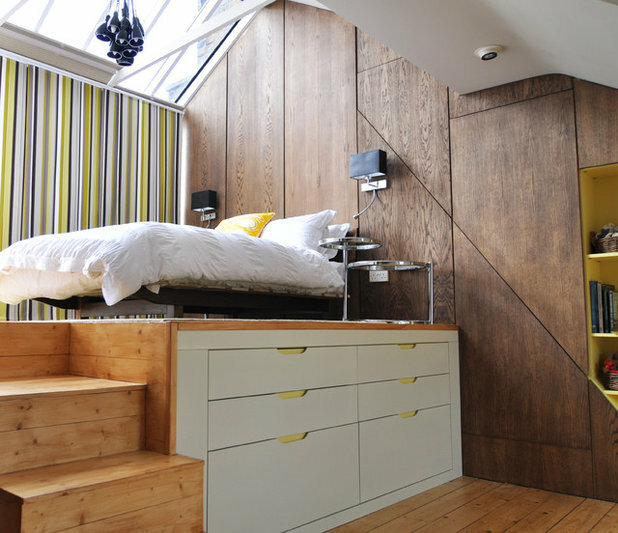 Features: A sloping loft ceiling is no impediment to smart storage. 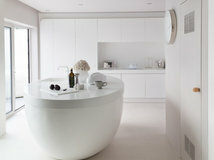 Here, the owners have managed to squeeze in cupboards, drawers and open book storage. Genius. 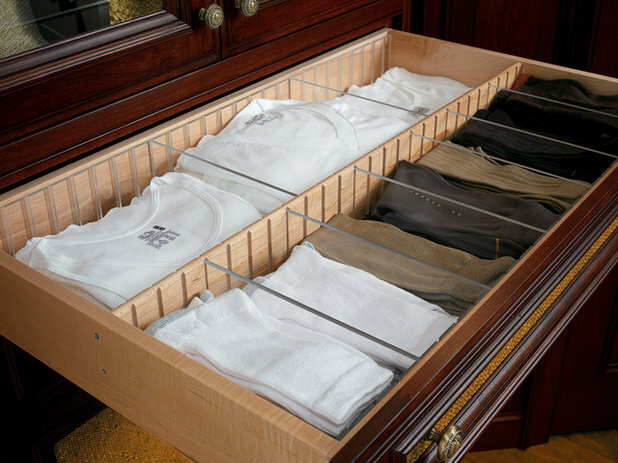 Features: Acrylic drawer dividers are a stylish and simple way to keep your t-shirt and sock drawer organised. 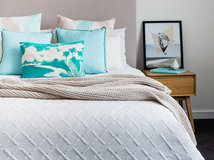 Features: Frustrated with trying to squeeze everything into your small bedroom? 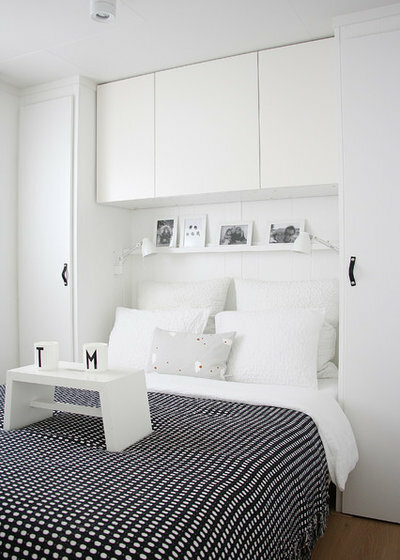 Take a tip out of this homeowner’s book and opt for a shelf bedside table that attaches to the door of built-in cupboards in place of a bulky side table. …and a close-up of that nifty pull-out shoe rack. 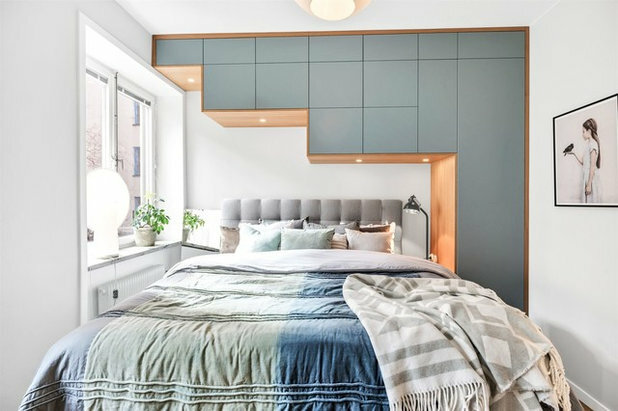 Features: The headboard in this guest bedroom has just enough space for a hanging rail and open shelves. Beautifully considered. 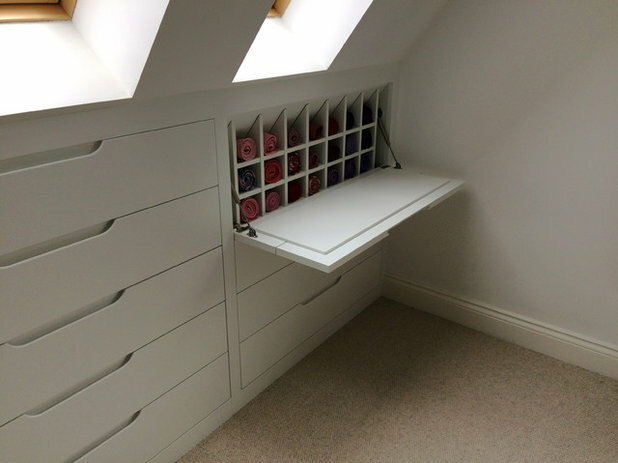 Features: Adjustable open shelving is a boon if you have a lot of folded items of different thicknesses, such as t-shirts and jumpers. 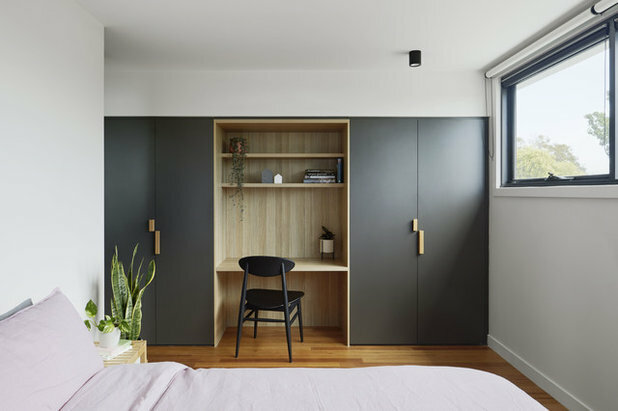 Features: We’re loving how the owners of this bedroom have used gaps in their built-in cupboards as bedside tables to free up storage space for clothes above and below. 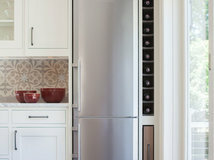 Features: A slender cavity is no impediment to creating your dream built-in wardrobe, as this style illustrates. 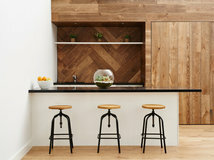 Features: This brilliant built-in wraps around a wall and has cupboard storage on one side and drawers and open display space on the other. 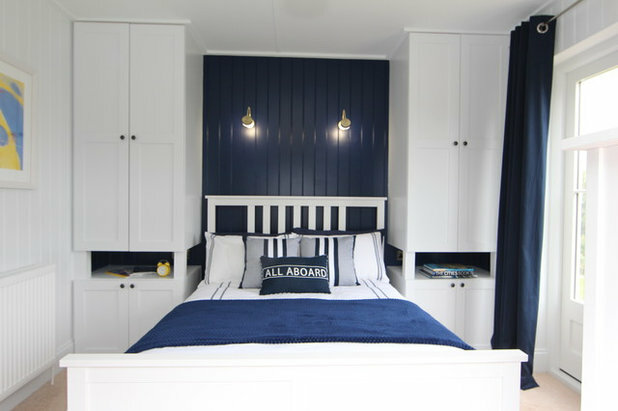 Features: The look of a bespoke wraparound wardrobe for a fraction of the cost… the owners here have paired two existing built-in wardrobes with a row of Ikea cabinets above the bed to create a custom look. …here’s a close-up of the drawers and recharging station. 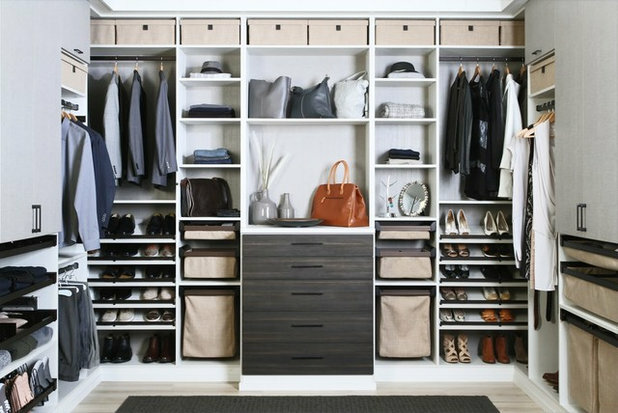 Features: Double your shoe-storage potential by storing footwear upright as the owners have done here. 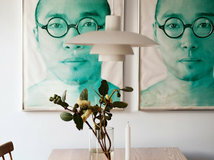 Storing them in pull-out drawers keeps the rest of your room tidy. 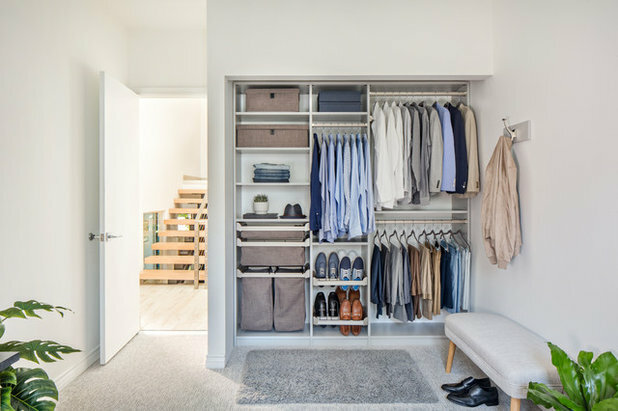 Features: Soft tones, lashings of space and a mix of different storage types to accommodate all your clothes, shoes and accessories… every fashionista’s dream. 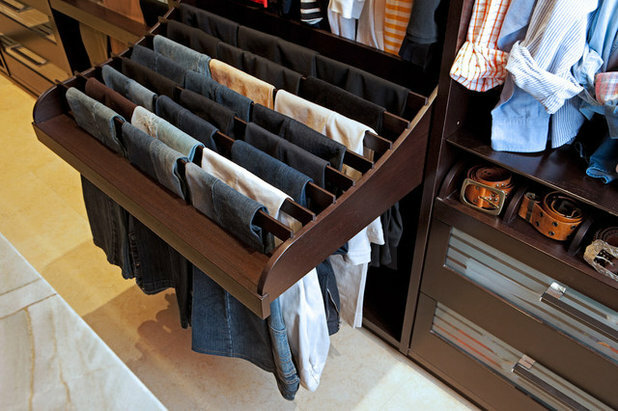 Features: Keep a tie collection organised and out of sight in special, built-in cubbies with a flip-down door. 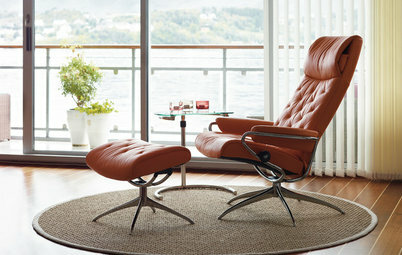 Features: A two-in-one solution that includes generous clothes storage and a study area. 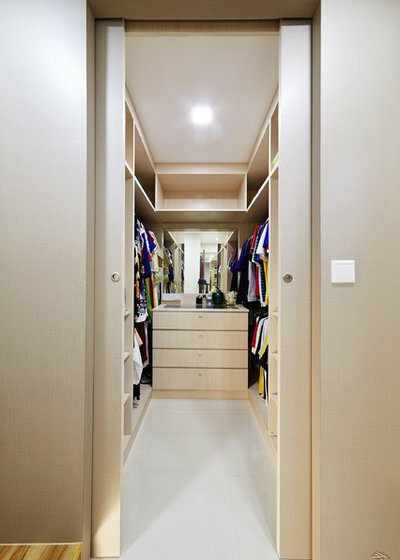 Features: You don’t need a huge amount of space to create a practical and stylish walk-in wardrobe, as this narrow-space design demonstrates. 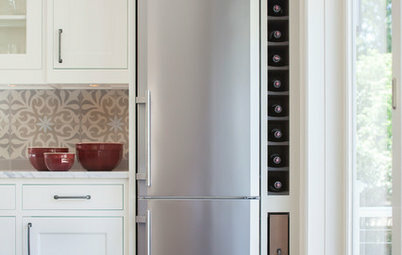 Space-saving pocket doors and a simple storage layout are two of the features that work so well. 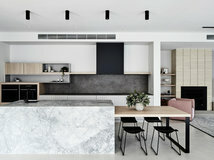 Features: A wall of flat-fronted, built-in joinery provides plenty of space for folded and hanging items, and feels very much in keeping with the minimalist style of the rest of the room. 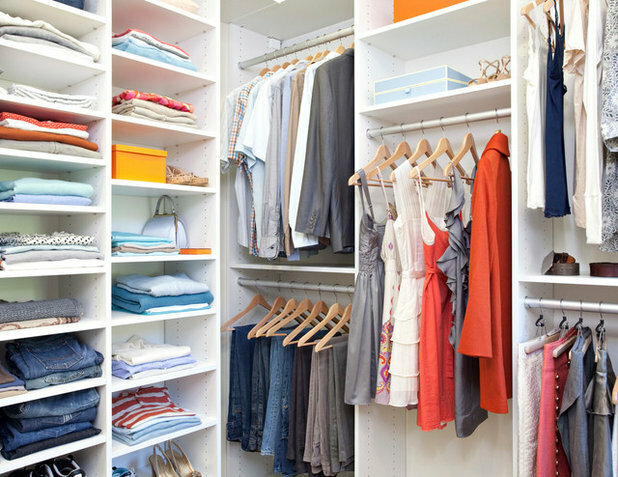 What’s your secret to keeping clothes and shoes under control? Tell us in the Comments below. 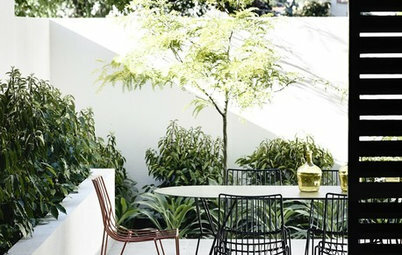 And while you’re at it, like this story, save your favourite images and join the conversation. 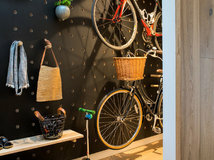 Interesting shoe storage ideas in numbers 8 & 26. 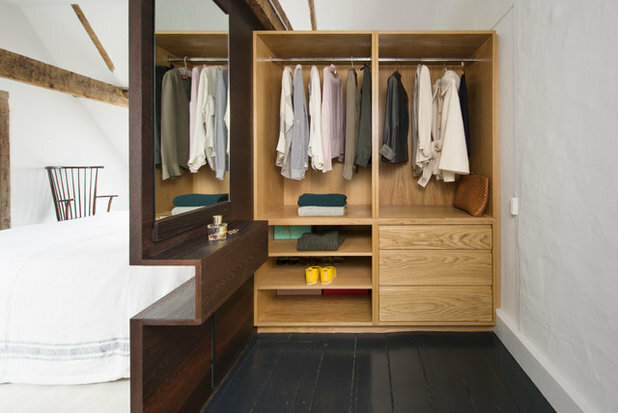 I also like number 10's take on individual wardrobes/dressing rooms. Thank you for this story! I am about to remove my old built in wardrobe with its 2 sliding doors, 1 hanging rail and a very awkward high shelf up behind the wall over the doors. 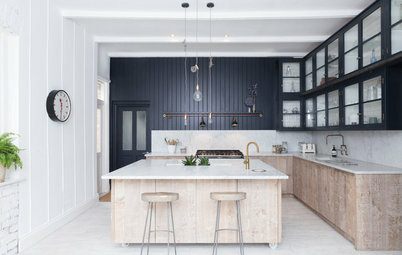 The whole wall with the sliders will come out, replaced by full height doors enclosing designated hanging and shelves for clothes, shallow drawers for shoes, shelves and hooks for bags and luggage, space for storage bins of off season items. Joy, oh joy! 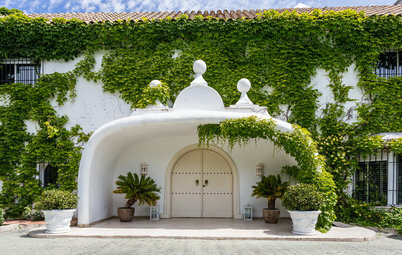 I hadn't realised what a great wall of storage I could gain just by raising the height of the doors! What a difference this will make! 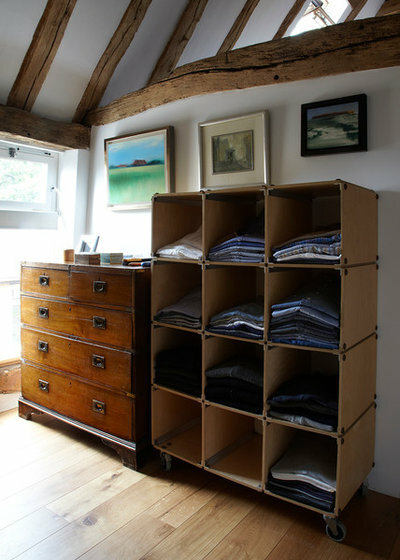 And I'm having such fun selecting all the useful options there are for storage of trousers, scarves etc! All those items that hang over doors, backs of chairs, drape over the towel rack! I am looking forward to this change! Nancy, your wardrobe predicament is exactly the same as mine and it’s encouraging to hear how you’re planning to overcome it - if you’ve any ‘after’ photos to share I’d be interested in seeing them here.